Light pinks and chocolate brown - a winning combination. This piece measures just under 21" and is full of sparkle and movement. 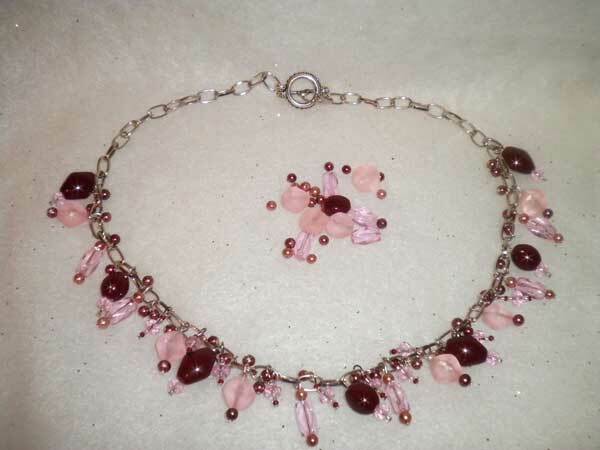 I've used fully-faceted glass rondelles & rectangles in light pink, small rounds in chocolate and coffee, silver seeds and chocolate ceramic beads in oval and diamond. A bit labor-intensive, but I love the results and hope you do too! Since this picture was taken, I've edited the clasp and switched to a lobster claw so that you will have versatility in the length.